We Search Trusted Retailers DAILY to find you the best deals on Sewing Machines and the latest Sewing Machines sale to save you money. The perks of having your own quality cheap sewing machine are fairly obvious. No more trips to the tailors to adjust the length of clothing, and having to sew on loose buttons with a needle and tread. With a good low priced sewing machine these jobs can be done in no time, and saving you money in the process too. However that all does depend on if you can use a sewing machine and if you one you've bought is simple to use too. So we'll look at a few must have features and what are best left for the professionals. 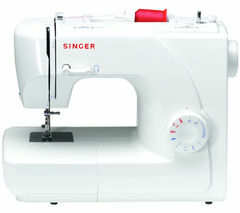 Sewing machines are widely available at big stores on the high street and also online too. But it really does pay to know what each feature does. These features are what you should be expecting on the top sewing machine brands and the most popular brands of sewing machine too. Built-In Stitches A quality sewing machine should come equipped with at least three built-in stitches, as well as one backstitch. The 3 stitches that you must have are a straight stitch, a zigzag stitch, a button stitch, and a backstitch to lock each stitch into place at the beginning and end of a seam. With these 3 stitches, you should be able to perform most of the stitching that is required on a day to day basis. Sewing Machine Free Arm Another essential feature to look for when shopping for a sewing machine, is a sewing machine that has a free arm with it. The free arm is located at the bottom of the sewing machine and protrudes out from the main body. A free arm allows you to stitch small, circular areas, such as those found on pants, cuffs, and armholes. A free arm provides versatility to sew various style of clothing. Essential if you plan of doing different types of sewing and improving your skills. Adjustable Presser Foot An adjustable presser foot allows you to determine how tight fabric is held as controlled by the feet of the machine. An adjustable presser foot typically comes with various settings to prevent puckering and stretching of different types of fabrics. In particular, attaching cords, zippers, or quilting together layers of fabric requires an adjustable presser foot. 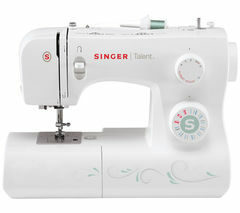 This feature is usually found on most sewing machine models however, so to get it should still b fairly cheap. Needle Down A sewing machine with a needle down feature allows the user to place the needle in either an up or down position. This allows the user to lift the presser foot when turning the corner on a piece of fabric, without creating an unwanted jump in the stitch. 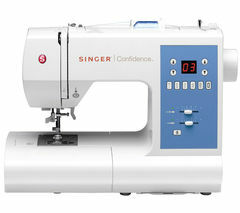 A sewing machine with the needle down feature allows you to choose their needle position and change it when necessary. This is massively helpful when sewing multiple types of fabrics and accessories. An Automatic Needle Threader An automatic needle threader is a hook and spring operation that, as the names suggest, threads the thread in the needle automatically. Purchasing a sewing machine with an automatic needle threader helps you circumvent the need to have a particularly steady hand, as well as prevents strain on the eyes. Additionally, an automatic needle threader gets the sewing process started at a much quicker rate than a mechanical needle threader, making the whole process faster and more efficient. But I'm sure we didn't need to tell you the benefits of this great feature. Threading the needle has to be the most frustrating thing in the whole of sewing. A One-Step Buttonholer The obvious benefits of having a one step button holder are massive, and if you've used a low priced sewing machine that has one, you'll never want to go back to one without. There are a variety of buttonholers available on different sewing machines. However, a one-step buttonholer creates perfect buttonholes with the turn of a dial. Once the setting is in place, a machine equipped with a one-step buttonholer creates a buttonhole without having to manipulate the fabric or machine any further. Consumers also have the option to downgrade to a four-step buttonholer, or upgrade to an automatic buttonholer, depending on preference and affordability. Compatibility with Add-Ons Not one of the most important features to look out for. This versatility allows you to purchase additional features for the sewing machine as your sewing skills advance, and the need for other types of sewing capabilities grows as a result. For example, in addition to the four built-in stitches that any quality cheap sewing machine should have, you can purchase additional stitches, as well as different needle positions. Because a quality sewing machine lasts a long-time, a consumer should give consideration to the future use of the machine, as well as its current necessity. Lightweight, Portability If you never plan of taking your sewing machine away for your workstation, then this is a non issue, however if you do plan on moving it around then this is something you'll want to look at. For those who move from place to place often, the sewing machine should be lightweight enough for easy moving so as not to damage the machine. Similar to the compatibility with add-ons, you should keep in mind that a quality low priced sewing machine should be with you for some time and you may want to think about how you'll be using it in the distant future. Top Load Bobbin The bobbin is a small wheel-like part that is found under the needle plate of the sewing machine. The bobbin provides thread to stitch the underside of the fabric. A top-load bobbin feature allows consumers to drop the bobbin into the top of the sewing machine without fiddling to get it in place. This function saves time and provides less hassle and frustration. Bobbin-Thread Lift The bobbin-thread lift feature is the counterpart to the top load bobbin. Once the bobbin has been dropped in the top of the sewing machine, the bobbin-thread lift feature brings the bobbin thread to the sewing surface so that the user does not have to insert their fingers under the presser foot. Similar to the top load bobbin feature, the bobbin-thread lift feature saves you time and unnecessary stress. These are just some of the big features to look for. If these all sounded a bit like gibberish, then you're probably best sticking to the cheap sewing machines and getting to learn your skills on them. When it comes to setting your budget for a cheap sewing machine, you should look at the features you want, and then find the cheapest sewing machine that has them. One of the best ones we've found is the Singer 1507. It's under £100, and is packed full of the features that we feel are the most important. Currys has this in stock and the customer reviews on it are great. 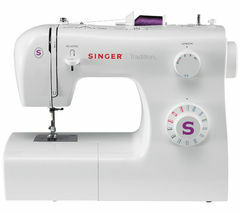 For those of you who are well versed in the art of sewing and are looking to up great you kit from a cheaper sewing kit, to something a bit more advanced, then the Brother FS40 is well worth a good look. It's just over £200, but the features you get a too many to mention here. Check it out at Argos and we're sure you won't be disappointed. Currys only have a hand full to choose from, but they are all top quality ones, Argos are great for the cheaper brands and cheap sewing machines. They have far more choice, but some of the real cheap ones are best left for practicing for kids. All the prices for these sewing machine are list on this site so it's super easy for you to see where you can buy the cheapest sewing machine from.